Things have been happening in the flat of late. It is increasingly the case that two of us are in the kitchen, either cooking together or one of us keeping the other “cook” company. It’s an absolutely tiny kitchen, as any of you who have visited will know, so a few things needed to happen to make it seem a bit more spacious and inviting. M had been saying for some time that more could be done with the wall space in terms of hanging things up, but I’d been a bit resistant. Not sure why, but I think I was worried it would start looking like a garden shed with all sorts of tools hanging on the wall. 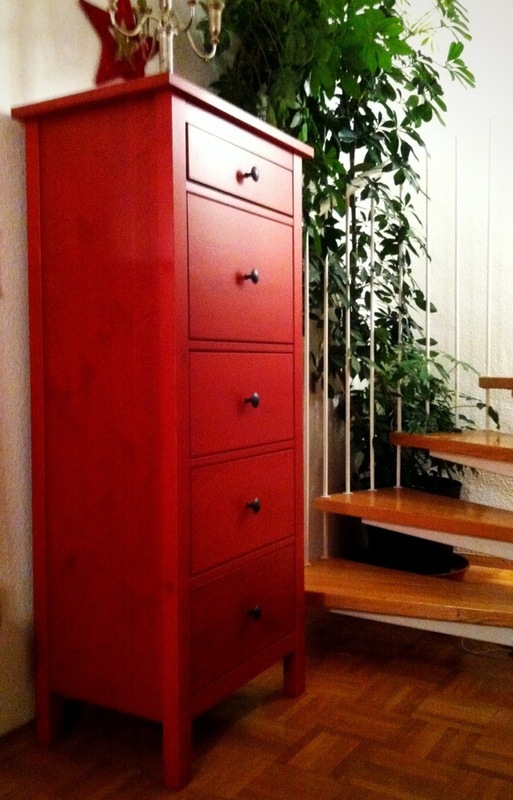 However, a careful look at the IKEA catalogue followed by a visit to the store had me convinced that this could indeed be the way forward. Lots of dry goods have been put into transparent jars, which means they can be easily recognized and are – hopefully – safe from the likes of flour moths, which have been caught lurking around the kitchen in recent months. One just has to be careful not to confuse the breadcrumb jar with the couscous jar – I’m not much of a one for labelling things. 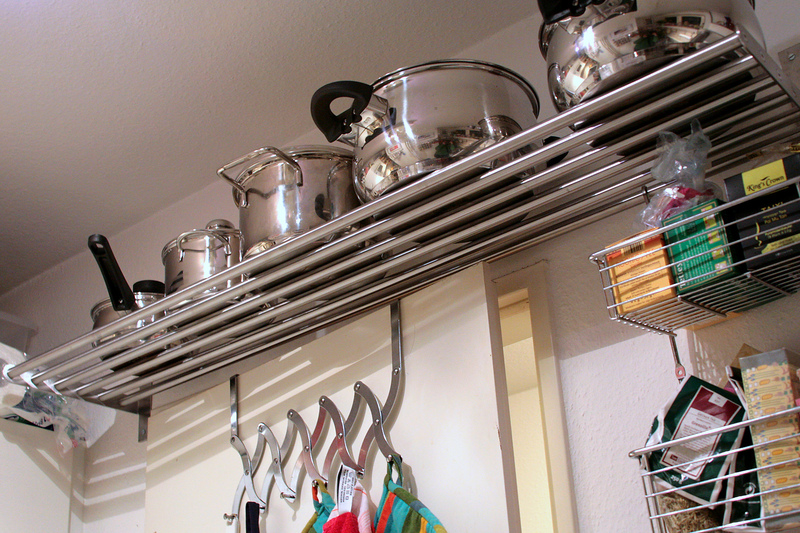 The kitchen now has a system of rails on which things can be hung – the first things we hung up were a spice rack, and a load of hooks for suspending kitchen implements like ladles, sieves, baking accoutrements and the like. The spice rack looks particularly good, I think, but there is also space above the sink for hanging a shelf for washing-up bits and bobs, and kitchen towel. 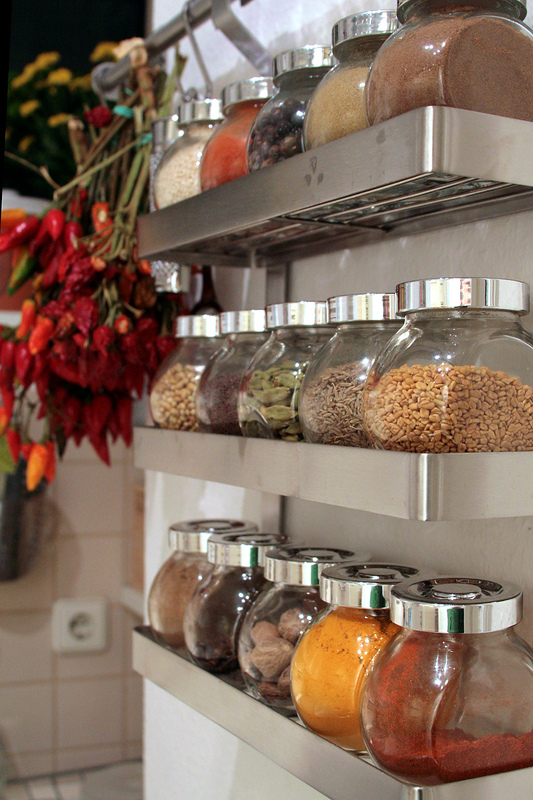 Herbs and spices used to be in a cupboard that was a bit hard to navigate, meaning there was much effing and blinding whenever anything was being cooked and – inevitably – stuff fell off the one shelf onto the work surface or couldn’t be pulled out because it was behind something else. Now a lot of things are on this rack, in particular those spices used in Indian cooking, and a listing will follow for the spice nerds among you. Top shelf (l-r): sesame seeds, hot paprika / chilli powder, juniper berries, ground cumin, ground allspice. Middle shelf (l-r): coriander seeds, brown mustard seeds, green coriander pods, cumin seeds, fenugreek. Bottom shelf (l-r): garam masala, black peppercorns, nutmeg, turmeric, sweet paprika. The herbs and other spices have remained in the cupboard mentioned previously, but there is now more space in there and so they don’t fall about the place quite so much. And the local Turkish / international supermarket always has these wonderful-looking bunches of fresh chillies, hence the prominent presence of these in various stages of drying (so far they have dried REALLY well and can, if wished, be ground and put in a jar as chilli spice). Another big improvement in terms of space is the pot shelf that is now above the door. Various sizes of saucepan can be stored here, and they even look rather nice so long as they are free of stains or smears on the outside. Plus the hanging system that is the same as that for the rails you can see in the other pictures means that I can hang my tea rack off the same shelf, saving yet more space on the work surface – yay! These are not brilliant photos, and almost all of them have had to be taken at some odd angle to get in the stuff I wanted to include (another disadvantage of a small kitchen: you can’t take pictures of it without a wide angle lens, and even then…). 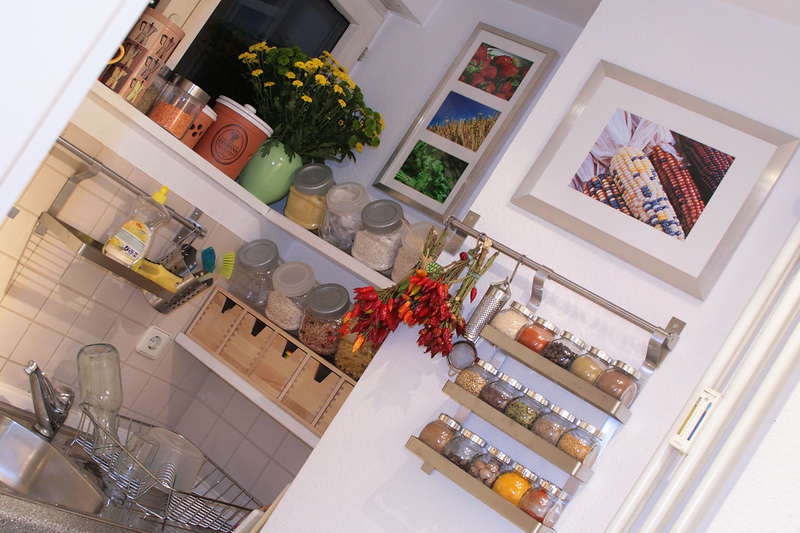 One of the other things M persuaded me to do was to hang up more of my photos in the kitchen. I’m really pleased with the one of Indian corn you can see in the first shot, which is a print I made, framed and hung up yesterday. I also hung a print of a pumpkin, which you can’t see here (but it was this shot, just so that you get an idea). The set of three pictures of strawberries, wheat and parsley is also a composition made out of my photos. So, finally the kitchen is an eminently habitable place and there is plenty of space to do stuff, be it slavish chopping / stirring activities, pouring the cook a glass of wine or standing around reviewing the day while dinner cooks. Life is very good indeed right now!